Bright and early on a Tuesday morning the Engagement ceremonies began. The timing of these are generally dictated by astrology, which explains the 7.30am start. The first ceremony is Vratham. This is where Carl and Uma are independently groomed for marriage. The bride’s ceremony is where holy thread, called kappa, is tied around her wrists to ward off evil spirits in the future. For the groom, he gives thanks to the gods of Indra (sky), Agni (fire), Soma and Chandra (who are both lunar deities). He is then ready to say goodbye to his bachelor days and prepared for his new life as the head of a household. The next stage is the actual engagement, known as the Nischayathaartham. This is where the families meet each other and the wedding date is set. Usually this is held a little bit earlier then the day before the wedding, but hey this is a destination wedding. Gifts are exchanged as a sign of goodwill. A reminder of what still happens in many parts of India are the dolls that are given as gifts, as the bride and groom are sometimes much younger. But in this case, it was a celebration of two adults coming together and joining their families. Now that the formal festivities of the day were over, the fun began. The night before the wedding a Sangeet is held. This is always meant to be a fun evening to get everyone excited about the pending nuptials. Traditionally a cultural evening, this one was incredible. Sitting on the balcony of my room that afternoon I watched them start setting up for the evening. 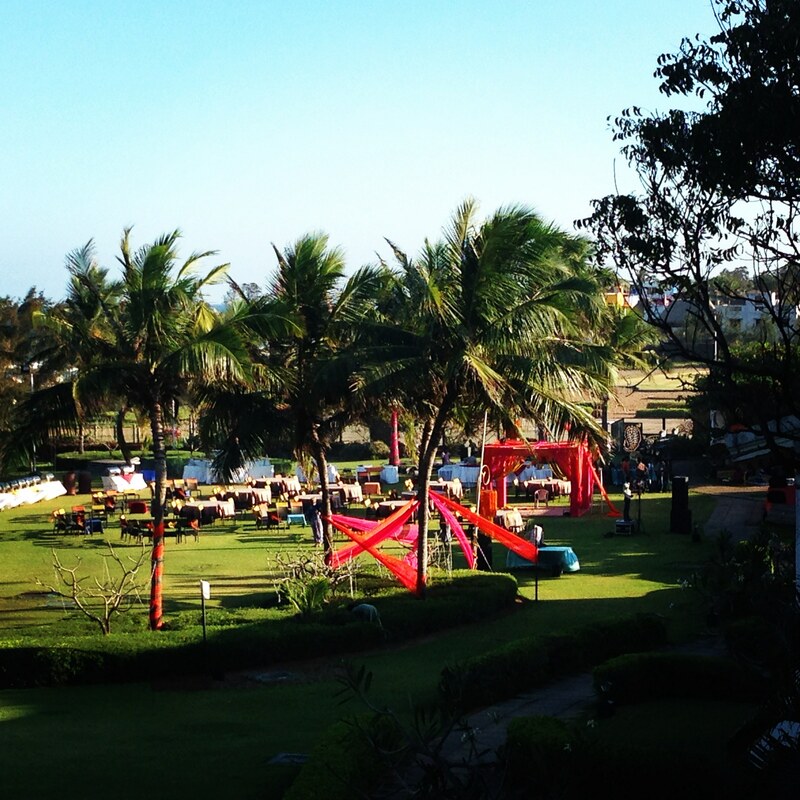 Before reaching the venue, all the guests met near the path leading to the gardens. We were there to celebrate the procession of the happy couple towards their party. 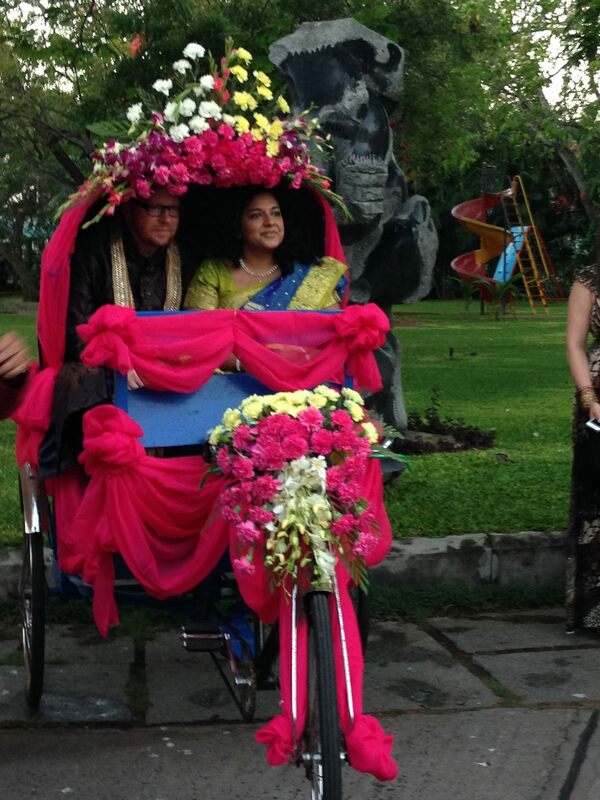 In true Bollywood style, they were led there in a hot pink cycle rickshaw, while the guests sang and danced around them. They were then seated on what can really only be described as a Chaise Lounge Throne, as the guest of honours for a spectacular cultural show. Dancers from Odisha and South India did some spectacular performances, these photos just don’t do justice to them. The stage was decorated in fresh flowers of every hue and the heady scent of jasmine filled the air. Behind us the Bay of Bengal lapped against the shore and the sea breeze tempered the humidity. Of course no Indian event is complete without food. A buffet style vegetarian banquet was set up behind the guests, with tasty curries and snacks that filled my belly but still had me going back for seconds (ok maybe thirds). To help us work it all off, the DJ got started and we all put our Bollywood learnings into practise. This evening was nothing short of incredible! I couldn’t even begin to imagine what the wedding would be like. simply brilliant. Liked it… most of your posts are simple fantastic.